April 18 Friday still pleasant & warmer Mer stood 65°+ 4 o c this PM. Spent the day with Rose. 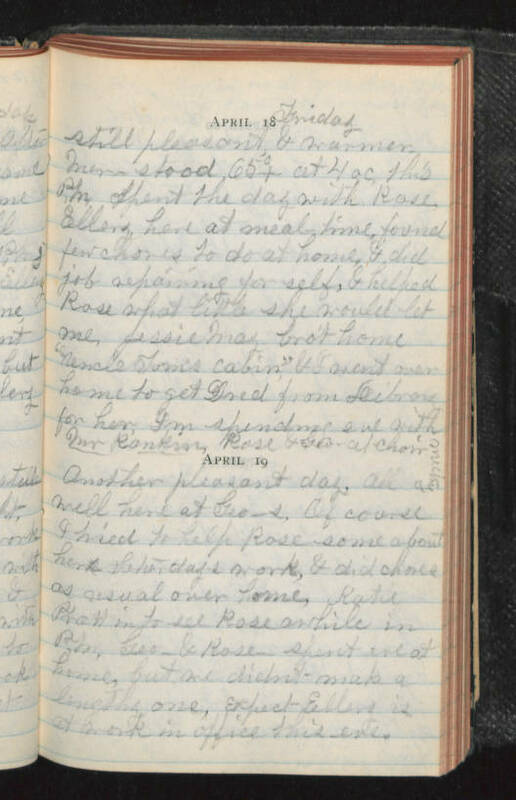 Ellery here at meal time, found few chores to do at home & did job repairing for self, & helped Rose what little she would let me, Jessie May bro't home "Uncle Tom's Cabin" & I went over home to get Fred from library for her, I'm spending eve with Mr Rankin, Rose & Geo at choir meeting. April 19 Another pleasant day, all well here at Geo_s. Of course I tried to help Rose some about here [illegible] her days work, & did chores as usual over home, Katie Pratt in to see Rose awhile in PM, Geo_ & Rose spent eve at home, but we didn't make a lengthy one, Expect Ellery is at work in office this eve.